This week's PopMatters post is about the recent Uncharted 3 multiplayer beta. I've talked a lot of mess about Uncharted's single-player design in the past, but that hasn't stopped me from thoroughly enjoying the multiplayer mode. 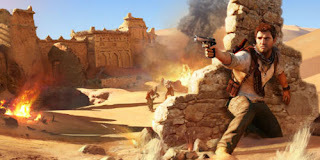 In short, it incorporates all of the innovations popularized by Modern Warfare and Gears of War without sacrificing Uncharted's unique traversal dynamics and vibrant art style. In fact, I argue that Uncharted's gorgeous visuals and platforming systems are more meaningful in the multiplayer context than they are in the single player context. Instead of dopey AI and scripted jumping sequences, you have to deal with human enemies actively looking to use the world to their advantage (and to your disadvantage). I'm not sure anyone has made this comparison, but I feel like Uncharted might be what a modern-day Jet Force Gemini game would look like. The third person view is unique and allows for more intricate platforming, but the game is still heavily dedicated to shooting. I'm not sure how many people played it, but I still remember that game fondly. Finally, the Uncharted 3 multiplayer beta has me thinking about the nature of "betas" in general. There are a handful of things I think could be improved (melee is still wonky, double kills happen frequently, and there is some interface stuff that could use work), but the overall experience is extremely polished. I imagine Naughty Dog is looking at the statistics very carefully and tweaking the networking and matchmaking systems, but I don't expect many changes in the final version. Instead, this seems like a great opportunity to get people hyped up for the game. I doubt a company like Naughty Dog could afford to put out a true work in progress. The triple-A market is packed with shooters and, with Modern Warfare 3 lurking around the corner, it would be suicide to try to introduce people to a half-baked product. It's telling that (as is the case with many console "betas") there is no in-game way to report a bug or send feedback. This strengthens my belief that, in addition to testing the game, modern betas are equally important as advertisements. They act as demos, giving people a taste of the what the full game has in store and stoking excitement in the months leading up to the full release. I'm not sure how much I like this, but I do know that it works: after playing the multiplayer beta, I can't wait for Uncharted 3. First of all, interesting comparison to Jet Force Gemini. That's now something that I will need to contemplate. Secondly, I'm glad the beta was able to change your mind, in some respects, on the Uncharted series. I still expect you to criticise Uncharted 3 when it releases later in the year but it's nice to know that, alongside those frustrations, you'll also be having a blast in multiplayer. I tried -- with varying success -- to get into Uncharted 2's multiplayer and found it somewhat refreshing after the more popular shooters out there. While I didn't analyse it too much (due to not being able to explore it as much as I would have liked), I put that feeling down to its verticality, and the different dynamics that the game's light platforming can provide in such an environment. Whether I'm right or not is something I'll need to explore with the new game, since everyone will be enthusiastic about it and will hopefully want to play. Despite having access to the beta, I didn't get to play it for more than one brief session, so unfortunately that didn't give me a clear picture on the iteration and improvements it had on display, as well as what makes its particular brand of multiplayer action so unique. Guess I'll find out in November, then. Hey Steven! As usual, I'm just being a big grouch when it comes to Uncharted; you know I'll be playing Uncharted 3, and I'll be as wowed by the production values as everyone else. We'll have to see, but the multiplayer might actually push me to buy the game. Uncharted doesn't really strike me as the kind of game that attracts people who like on-line multiplayer, but I think it has a chance to make a few converts.